The Art Lending Library, which includes work by Dean Hughes in its collection, is holding a public procession of artworks through the city of Sunderland this Saturday 16 May from 12 noon. Join Zoe Walker and Neil Bromwich and the Art Lending Library Librarians and Art Handlers for the public procession. Easington Colliery Brass Band will also accompany the parade, which will begin on High Street West and end at NGCA with a drinks reception and a chance to look and borrow the artworks. 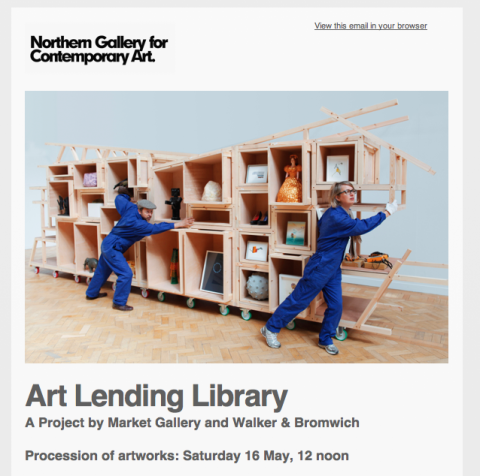 The Art Lending Library is an evolving social sculpture, which houses over 50 international contemporary works of art that can be borrowed and enjoyed in your own home. 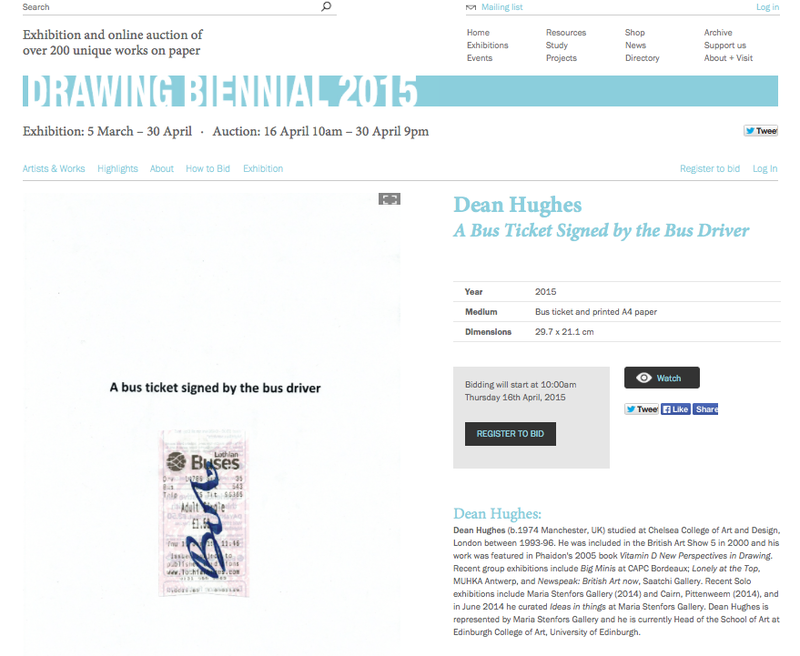 Dean Hughes has donated ‘A Bus Ticket Signed by the Bus Driver’ to the Drawing Biennial 2015 exhibition and auction, which features over 200 new and recent works on paper by established and emerging artists. Artists have been selected by Drawing Room directors Mary Doyle, Kate Macfarlane and Katharine Stout, with additional nominations by a panel of leading international artists, museum directors, curators and collectors. Each selected artist has been invited to make an original drawing in any medium on an A4 sheet of paper, which is exhibited in the gallery in a democratic hang that gives each artist equal prominence. Drawing Biennial 2015 culminates in an auction which runs for the final two weeks of the exhibition, with all works available to bid for via their website. With each drawing starting at only £250 this is a rare opportunity for both new and established collectors to acquire unique works on paper. 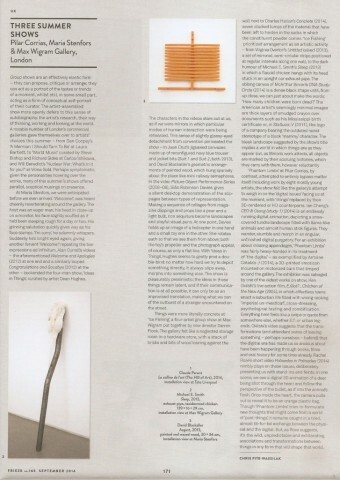 The sale of the works raises vital funds to support Drawing Room’s programme over the next two years. Dean Hughes is featured in ‘SMALL Rome’ at Frutta, Rome, in a group show curated by Adam Carr celebrating the small and minute, taking an inverted cue from Rome’s large population as well as from the notably grandiose gestures by the Romans. Maria Stenfors is delighted to be presenting works by Lilah Fowler, Dean Hughes and Mela Yerka at The Manchester Contemporary art fair. Returning for the fifth consecutive year, with a new home at Old Granada Studios, it is the only gathering of high–calibre, world-class contemporary art galleries outside London. Ideas in things curated by Dean Hughes at Maria Stenfors is reviewed in September’s issue of Frieze magazine.